I visited the Exhibition on 11th June, with two fellow OCA students. The Farnham Campus was originally an Art College but is now part of the University for the Creative Arts. Their website informed me that they have over 2,000 students studying a wide range of creative arts subjects, including fine art, photography, textiles, crafts, film, graphics, journalism and advertising. It was a good opportunity to go along and see some Degree work first-hand. There was also an Open Day running when we went so there were a large number of young people and their parents being given group talks by staff at various points throughout the College. 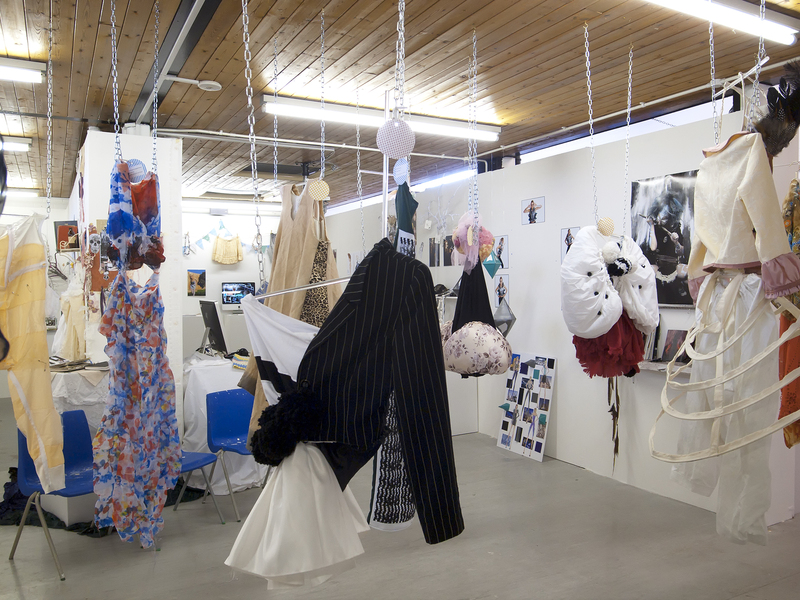 Many of the students were exhibiting in a large ground floor hall. As to be expected, there were a variety of themes depicted. There isn’t space to describe all of them here but I’ll mention some which I found eye-catching. Emmie Thorstenson is Swedish and she had put together a series of black and white images titled “On the Verge of Adulthood”, which were beautifully exposed, sharp and clear. I’m mentioning her nationality because her images, somehow, reminded me of what I imagine her country is like. I saw that she is also exhibiting at the Bargehouse, Oxo Tower Wharf, London and I think she will be a photographer to watch for in the future. 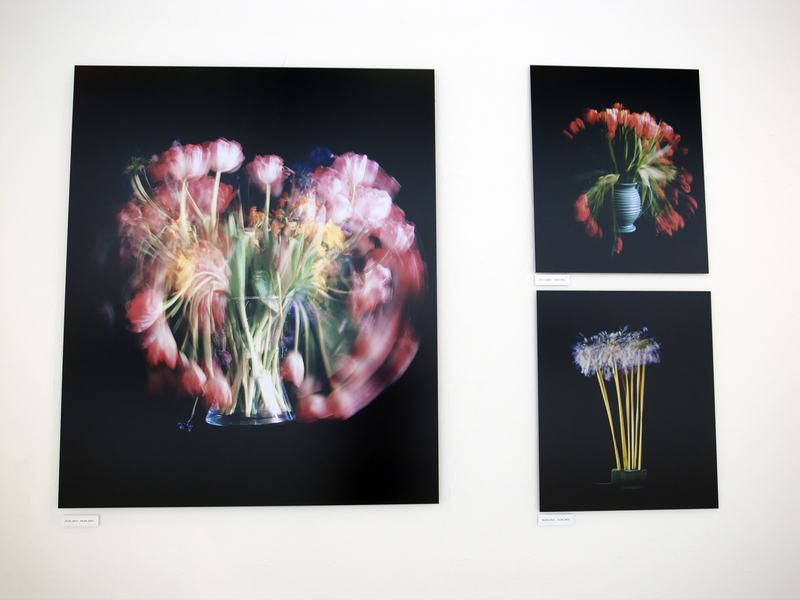 Chris Spackman had a series “Unstill Life” in memory of a friend of his who had died from cancer. The above doesn’t capture the quality of his work but his website link is below. The images are the outcome of continuous exposures of up to three weeks. From the main hall we wandered the corridors finding exhibitions of other Degree work and also Foundation and Access students. 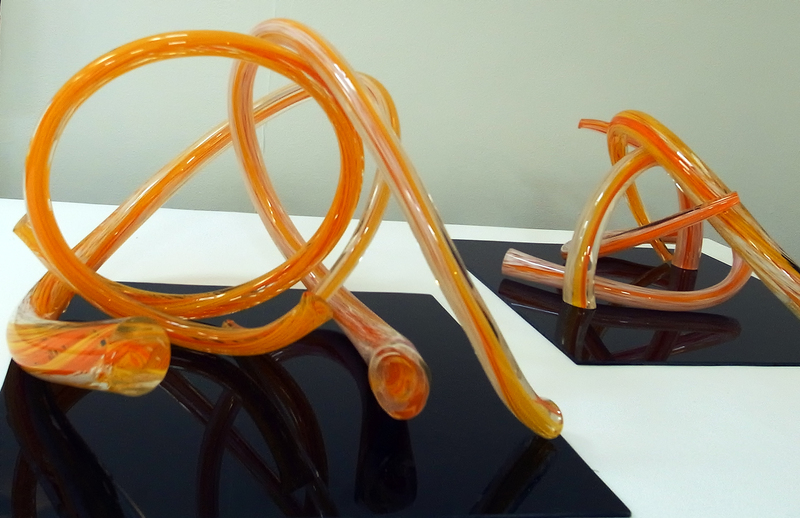 There were ceramics and glass, including this piece by Emma Clench which was a glowing orange. the information on her website says that her work is concerned with identity, both as a visual construct and as narrative. There was also one section which, at first sight, purported to be a museum exhibition of work by ornithologists. Paintings and drawings and various artefacts. It was a clever illusion created by Jose Nieves. I didn’t take a photograph (I should have done) but his website link is below. 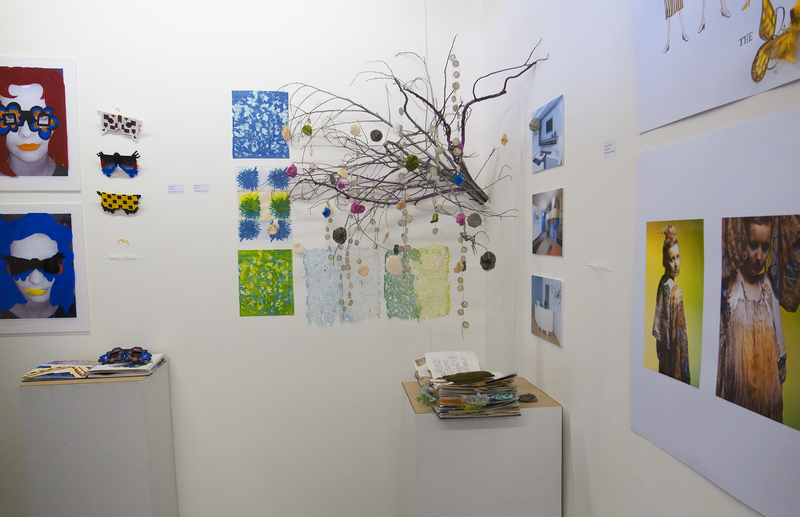 In the Fine art section there was a wonderful piece of mixed media created by Natasha Caine from found objects. 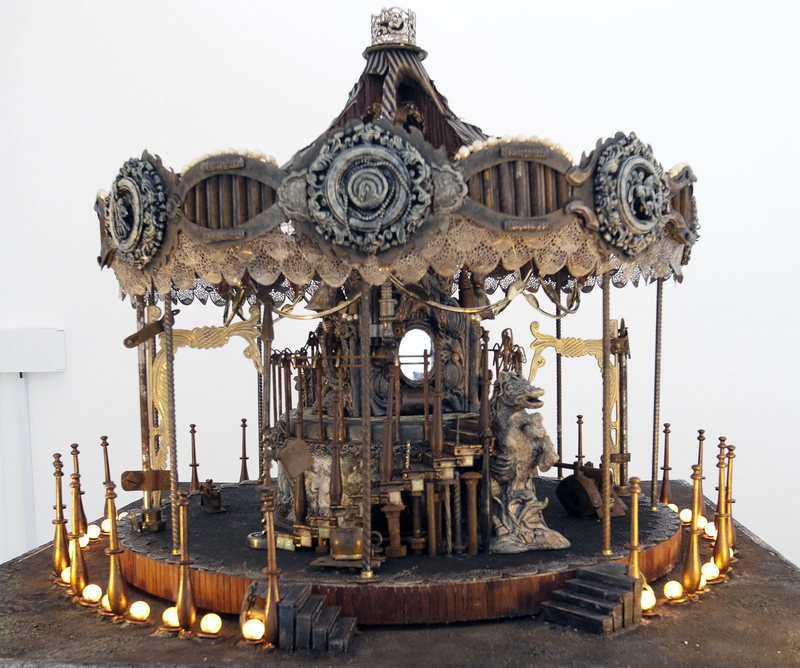 It was titled “Carosellas” which were apparently the Spanish entymology of carousels, and were spinning mechanisms for battle training/tournaments. There were several sketchbook/working logs that were pieces of art in themselves. I’ve seen some on the OCA site of course but they are so much better in reality. 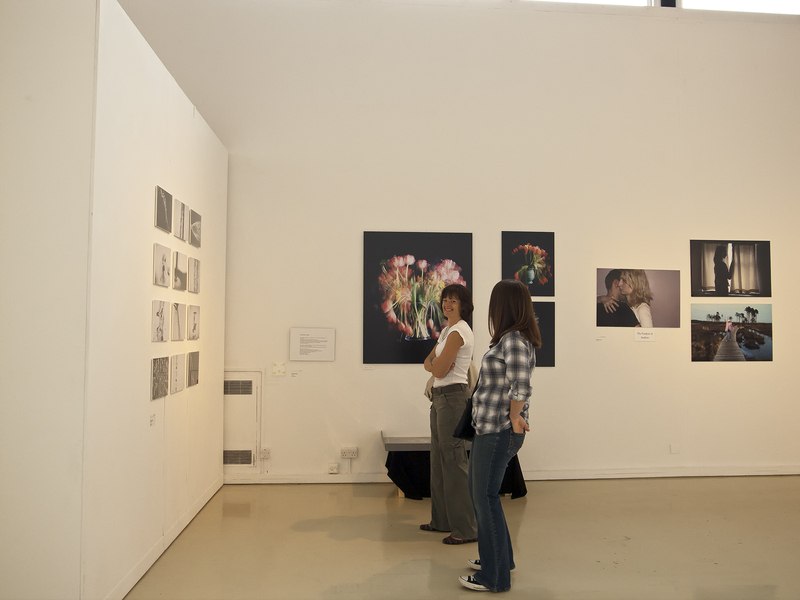 It was, of course, a different experience from visiting the London exhibitions of famous photographers and artists, but so good to see a wide range of work and appreciate the imagination and creativity of the students. The more informal atmosphere helped me feel nearer to the work as well. This made it less daunting because I could imagine that, if I complete the Degree, I might one day be able to reach their standards. Because it is a University and I saw several young students visiting on the Open Day I formed an assumption that contributors to the Exhibition were all young adults. However, I’m probably wrong. Overall it was very useful to see how the prints were being exhibited – framed, unframed, in box-frames and also on aluminium. Some of the students had also produced photo-books of varying sizes (including Blurb books) to accompany their images. 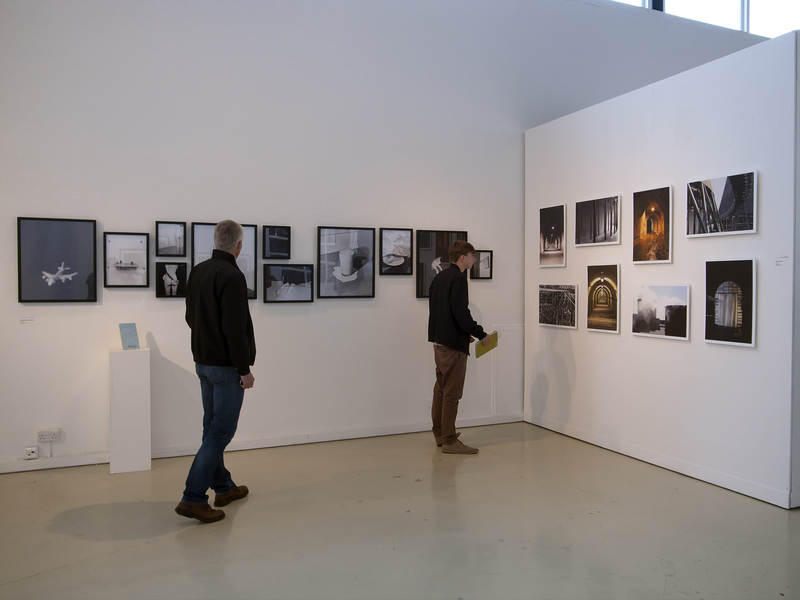 The Lightbox, Woking : Exhibition, ‘Ways of Seeing’. The Lightbox is a gallery and museum built by the side of the Basingstoke Canal and almost in the centre of Woking. It was designed by Marks Barfield Architects who were also responsible for the London Eye. The Lightbox has two galleries, which host a range of various types of exhibitions, and it also has an interactive museum of the town’s history. I’ve been several times but, on this occasion, (22nd January 2011) went to see ‘Ways of Seeing’ an exhibition curated by a group of people with mental health problems. The brochure informs us that two years was spent working on this project. The group visited a number of museums and galleries to learn how exhibitions are curated. They then spent months looking at items from the Ingram Collection of C20th Art and deciding which of them they would like to respond to. A further six months were then spent working with artists in a range of workshop sessions, to produce their own responses to the chosen works. 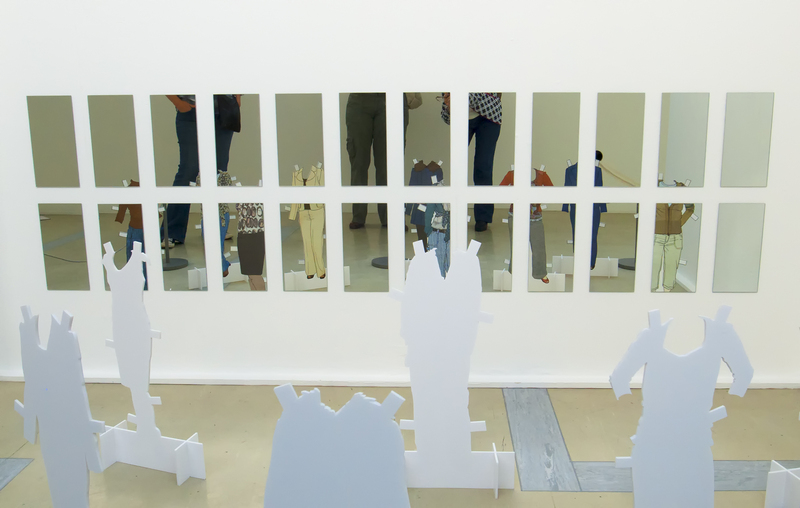 A selection of their new works is exhibited alongside the pieces by the major artists, together with a number of short videos of the process by the film-maker Lee Cavaliere. The group members had produced paintings, sculptures, drawings and prints, providing new interpretations of the pieces and I thought there was some really talented work on show. The brochure contains quotes from some of the members and photography featured for many of them in their daily life. I was a little disappointed, therefore, that there were no new photographs in the Exhibition. I suppose there is something extra in the act of just sitting down with others, discussing and engaging with a piece of art in a more tactile way. It’s just occurred to me that maybe more creative areas of the brain are in operation through this as well. I’ll have to do some research on that. I worked in the mental health field for several years and ‘art therapy’ has been around for a long time but this seemed a much more holistic way of engaging people. It must have been really satisfying for these particular group members to see a project through like this. Afterwards I went to have another look in the small museum. It’s in different sections and really well put together through a multi-dimensional approach. Many of the people of Woking contributed their personal photographs and mementoes and also recorded narratives of what life used to be like for them. The records are accessed by picking up various old telephones which are dotted around. There are brochures and photographs of Brookwood Cemetery from 1900 onwards; film and photographs of the opening of the Shah Jehan Mosque (the first in Britain). There is also memorabilia from Brookwood Hospital, a large psychiatric institution opened in 1867 and closed not so long ago to make way for expensive new houses and apartments. This particular part of the museum has models of the mind and early definitions of mental disorder. There are also various objects such as wrist locks and neck collars and a scale model of a special type of whirling chair which appeared to have the same effect as electric shock treatment. There are photographs of staff and patients (some of them in art therapy groups) and what looks like members of the Friends of the Hospital enjoying a dinner and dance. I left thinking about the use of photographs as images of record and for advertising purposes – “a wonderful new garden cemetery”. I also had this query in my mind concerning photography as therapy which I want to explore further.